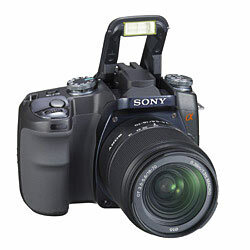 Sony α100 (Alpha 100) digital SLR camera is the first camera released by Sony that uses Sony α mount system (alpha in Greek letter), which is based on Konica Minolta camera technologies, acquired by Sony after the end of Minolta’s camera operations. The α DSLR currently has two models i.e. 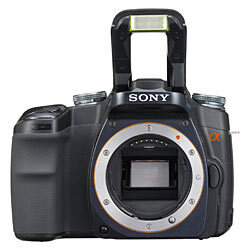 Sony α (alpha) DSLR-A100K which comes with 18-70mm SAL-1870 lens and Sony α (alpha) DSLR-A100 with camera body only. Sony A100 features 10.2 megapixels APS-C size CCD sensor, Dynamic Range Optimizer to automatically increase detail in bright and dark picture areas, Anti-Dust technology, Eye-Start autofocus system, Bionz engine, Super SteadyShot image stabilization and 2.5-inch 230,000 pixel LCD. ComputerAct!ve (link dead) has a first look review on Sony Alpha 100 digital SLR camera and concludes that “our first impression is that the Alpha was a good, perhaps even great, digital SLR, but that it will be a couple of generations before we see Sony deliver something truly outstanding.” The good points include easy to use, fast and responsive plus capable of some stunningly professional results, with the right lens attached. Bad points are slight plastic feel, loud shutter noise and 600 pounds is the body only price where lenses cost extra. TrustedReviews reviews Sony Alpha α100 Digital SLR and concludes with overall rating of 9 out of 10 that it’s an extremely impressive debut from a new player in the digital SLR market. The Sony Alpha α100 is pitched at the consumer end of the market, but is actually a better camera than most of its mid-range rivals too. It bristles with clever technology, but is very easy to use and produces consistently excellent results. It would be a good camera for a newcomer to SLRs, but more experienced users will also find it very satisfying to use. PopPhoto (link dead) has a hands on review on Sony Alpha 100 DSLR and lists out the top features and functions including nice body, true APS-sized 10.2MP (effective) CCD sensor,ability to accept CompactFlash Type I/II cards and microdrives plus Sony Memory Stick Duo cards with a supplied CF adapter, Super SteadyShot built-in image stabilization, dust repulsion, eye-activated auto-focus system, sharp 230,000-pixel resolution with wide viewing angle LCD screen, 0.83X viewfinder magnification ratio with approximately 95% accuracy, extensive metering and exposure controls, programmable buttons, ISO settings range from Lo80 to 1600 with an additional Hi200, Density Range Optimizer (DRO), pop-up flash has redeye reduction and a guide number of 39 feed in ISO 100, compatible with all existing KM and older Minolta lenses, and long battery life. Pocket-lint has a first look review on Sony Alpha 100 DSLR digital camera and concludes that from Sony appropriating the KM D-SLR technology to the launch of the Alpha 100 and a complete camera system, it has taken 6 months. Obviously, a lot was happening behind the scenes prior to KM pulling out of the photo market, but this speed is something of an indicator, a statement of intent, of just how serious Sony is in making inroads into the current market dominance of Canon and Nikon. Only time will tell how successful it will be. More specifications, features and sample photos at official Sony α Alpha website or SonyStyle DSLR page (no longer available).